I find that having a shell access account out in cyberspace is very convenient for various network and software testing chores and indispensable to my work, both at home and at the University. It includes Apache web server and OpenSSH access to a full ports tree loaded with great software like FFmpeg, ImageMagick, netcat, fetchmail, many scripting languages like Perl, Python, Ruby, PHP, and all password protected. GNU-Darwin internet services accounts, now include email, shell access, total SSL encryption, SMTP-on-LAN, web hosting, web mail, IMAP, virtual domains and flexible subdomains as well. Given all that we provide, this is a deal that is hard to beat. The first month is free, and thereafter it is only $15 per year. 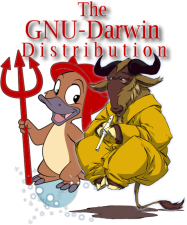 We also provide free access to GNU-Darwin coders and contributors. These are not mere email or web hosting accounts; for example, if you wanted a new user name, webpage, gnu-darwin subdomain, or something special, we often include it at no additional charge. Some of our developers have made excellent use of these accounts, so that they are among our top referrers. Here are their web account links, so that you can see what is possible. Cheers! In addition, more information about these accounts and everything else that the distro has to offer is now described in our new User Guide and Cookbook, which is also worth a read. Please enjoy and spread the word about these useful accounts.